Inside: Minimalism has amazing benefits for moms, but if we aren’t careful, our desire for control over the stuff in our homes can negatively affect our relationships. 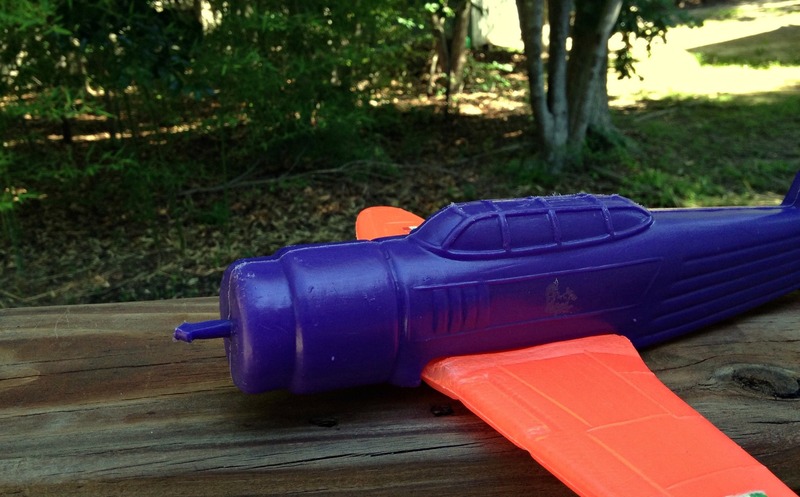 It was a purple airplane with orange wings – big, ugly, and cheap-looking. Such a simple thing, but it taught me such a profound lesson about another potential downside to minimalism, one I had never really thought about before. Related Post: Minimalism: It’s All About Experiences…or is it? The doorbell rang. When I opened the door and looked down, I found our small five-year old friend standing there, arms outstretched with his generous gift. I cringed inwardly: yet another toy that didn’t fit our carefully curated toy collection. I accepted it begrudgingly, knowing exactly where it was going after the door closed: the trash. That’s how bad it was – in my mind, it wasn’t even donation or yard sale worthy. I definitely didn’t want it in my house. What I didn’t anticipate was this very same friend coming over to play later that day. Can you guess the sad end to this story? Yes, he found the plane just where I had left it: the trash. I will never forget his crestfallen face. He retrieved it, turning it over and over in his hands. “What? This is…in the trash?” he asked in confusion, his precious gift deemed worthless. I really said that….to a five-year-old. I’m not proud of it. My token thanks was an afterthought, really. It came a split second after it occurred to me that my words just might have hurt him. But what I cared about far more than his feelings was my own sanity. 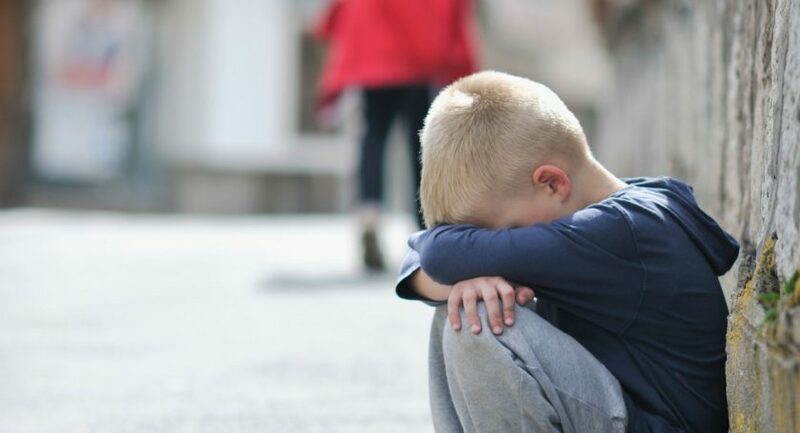 I wanted to be in control of the stuff in my house, and I wanted it badly enough that I didn’t take even a second to care about a little boy’s feelings. And so I stumbled on this other downside: how we approach minimalism can be a little selfish at times. Now before you flip out and tell me all the benefits and how I don’t understand minimalism at all, please – in all politeness – save your breath (or your typing). 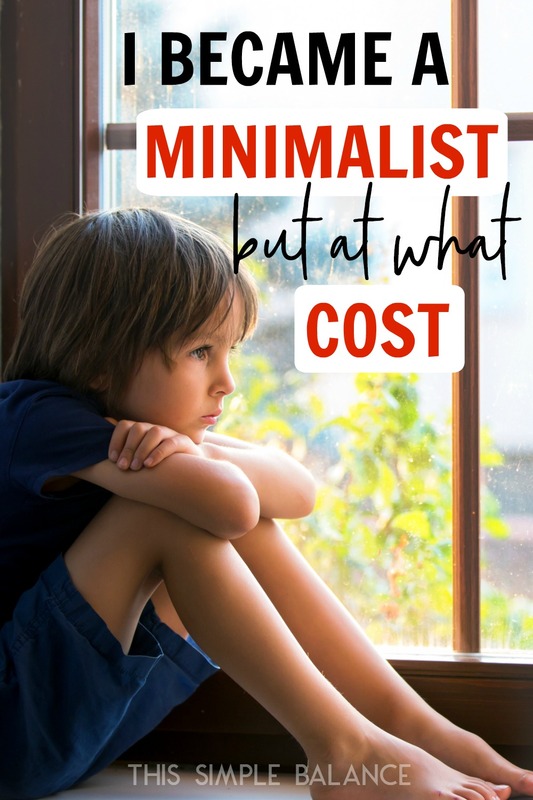 Allie Casazza took the words right out of my mouth: “Minimalism saved my motherhood.” Minimalism allows me to spend time with my kids, homeschool, blog. I know the benefits, and I’m thankful for them every day. To be very clear, I love minimalism. I promote it. I believe in it. But just because there are so many wonderful benefits does not mean that the way we personally interpret and approach minimalism cannot be detrimental to ourselves or to others. I realize that getting healthy in any way does require a certain period of self-focus. Learning to set boundaries, live a healthy lifestyle, and take control of your decisions takes extraordinary effort. While you find balance, thinking about anyone else other than yourself and your family is extremely difficult. But I’ve realized that minimalism, like anything else, can be taken to an extreme. I cared so much about guarding my house against clutter that I forgot to care about the ones who love our family so well. I forgot to care about what anyone else in my family wants either. The trouble with minimalism and growing families is the clutter never stops. Most kids are by nature little collectors. Even if it’s not expensive toys, it’s rocks along the road. It’s twigs and leaves and ship after ship they’ve built with LEGOs. Keeping up with it is not as easy as minimalists make it sound, especially when you homeschool and kids are in the house all day every day. Having kids puts you in an ongoing uphill battle against clutter. Decluttering is constant and never done, kind of the like the laundry and the dishes that also come with little kids. Now, did any minimalist author tell me to snub “clutter” gifts, discarding them like trash? No. That was all me, my own selfish response, and I own it as such. You see, in my zealous pursuit of minimalism over the past few years, I’ve extremely neglected this little thing other generations knew so well: gratitude. When grandparents or friends gave us gifts that I considered clutter, I was just plain unthankful. Some days, it bordered on resentful. Didn’t they know how hard I worked to declutter our home and now they’re giving me more to deal with?! I didn’t stop to think that some people express love through gift giving (and some people receive love through gifts as well), and some of those people cannot afford to give the experiences promoted by so many minimalists today. Museum passes, gift cards to the movies, trips…those things cost money, beyond what many of our loved ones can afford. So they pick out the $10 toy from Target, and they wrap it lovingly. They excitedly offer their carefully selected gifts. They eagerly anticipate the look of joy on the receiver’s face. The same is true of little kids who love to give gifts. They have little to no money to spend, so they craft away or choose one of their own toys to give. They pour their hearts into those crafts. They sacrifice their toys for love of the recipient. Those little crafts drive me crazy, I admit. I hate knick knacks, and sentimental gifts are especially difficult for me to declutter. I feel so guilty throwing away those popsicle stick picture frames my kids make for Mother’s Day. But after the purple airplane, I vowed to make a choice: the choice to receive all gifts with love, knowing I will figure out what to do with them eventually. One more small bin in my closet to house those tokens of love is not the end of the world, especially if it allows me to receive those little trinkets with a genuine smile on my face. Because those offerings aren’t really about me at all. A lot of gifts, whether they should be or not, are about the giver. So what’s my answer to this downside? To keep every gift forever and to never say anything about my preferences to anyone? No. I will continue to make helpful Amazon wish lists for Christmas and birthdays for relatives. I will share more frequently about my experience with minimalism, so family and friends understand the effects of clutter on my soul and how freeing decluttering has been for me as a mom. When I share openly, I tend to get more questions about the kinds of gifts we would like to receive. It helps, and I’m thankful for the chance to share what we truly need and want. After the purple airplane, however, I am committed to graciously receiving all gifts, even though I know that some of them may be enjoyed for only a few short days. Then with quiet thanks for how much we enjoyed them, those toys will make their way to another family with kids who need them and will enjoy them more. You want to know the unexpected thing about that airplane? My kids love it. They play with it daily. Sometimes the toys you least expect to be a hit get fought over the most. What I know is that a purple airplane pulled me out of my bubble. I wiped the fog away from my glasses and can see a little more clearly, and it’s a good thing. It reminded me yet again that minimalism is a privilege. It showed me the power that my words and actions have on the smallest of people. It reminded me to keep this simple balance in everything, but especially in minimalism. And it taught me all over again a lesson my mother taught me a long time ago, when I was small: to receive every gift given with grace and with kindness and with gratitude. I want to remember not to minimize others as I pursue minimalism. The war on clutter can pause just a minute to love a small boy and his airplane. I’m finding this post a little late, but I just wanted to comment that it touched me deeply. Thank you for sharing. And responding to many of these comments with such love and humility. I am tucking this away as I BEGIN my minimalism journey. Thank you for blessing me with your choice to share what you have learned! You’re welcome, friend! It’s hard to look back on that time, but I’ve come a long way. I hope other moms can learn from my mistakes. I am a lily-guilder/collector of everything, my 15 year old daughter saves chocolate wrappers because they remind her of the happiness in getting them from someone she loves…she also has very little sense of smell, but CAN smell chocolate…and skunk spray..which she delights in Because she can detect it.my husband is a minimalist, , but only with things that don’t pertain to HIM. We both accept the others choices, and our kids…and leave it up to them to decide as long as they have a path to their bed…we use the dollar store for containers, and encourage them to be neat about their collections…at times, they will decide in their own to let things go, but we always let them be the decider, it teaches them both sides of the spectrum. Hi Mika! I really appreciate you taking the time to share your thoughts and feelings here. It definitely was heartbreaking, and I definitely regret my words. I don’t regret, however, how it woke me up to what my desire/need for control was doing to my own heart and how it affected my interactions with those around me. I’ve found that the most valuable life lessons are born from painful mistakes (how I’d love it if this weren’t the case). While it was tempting to go back and edit this post to gloss over the ugliness of my words, the lesson couldn’t be shared without admitting the absolute ugliness of my words. I can only hope that others can take something from my mistakes and what I learned and avoid similar encounters in the future. Thanks again for taking the time to comment! Great article! ❤️ It’s true- we don’t want to intentionally or unintentionally “minimize” others or our relationship with them in our efforts to live minimal. Ironically, i feel like to goes against the very purpose of my pursuit of living an intentional life. It’s hard- I have one child who would be perfectly happy for me to keep every single rock we’ve come across. ? I don’t know how I found your blog. It seemed to just show up in my inbox. I follow Joshua Becker and I’m a homeschooler so I probably snagged some great “freebie” from you. But this post is pretty powerful. I’m all teary eyed. It is hard in our modern world with so much. Christmas? I have felt ungrateful about presents to be sure. But I was a sentimental child and I still have some of my own treasures, so I’m not a true minimalist, my kid’s dressers are cluttered with their finds. But your message is clear and as I said I think it’s a powerful one: sometimes people give things to show love and sometimes it’s hard to let things go because we know that. I don’t think there is an easy answer other than to maybe live with something just for a while and see if it will bring you joy maybe even if it didn’t at first? It is still such a struggle. I have to remind myself of this constantly! I also need to remember that it’s showing appreciation for the gift when its first given, and appreciating the givers themselves, and not necessarily keeping it forever, that matters. June, I loved this post! Thank you for telling us about this incident. Such an important lesson. My dear father, who was a wonderful and generous man, never learned how to receive a gift. One time we brought him a small gift (of something he liked) that we picked up on route, and his reaction which didn’t surprise me in the least shocked my husband. I said, Oh that’s just Daddy. He said, No that’s just rude! You’re so welcome, Kensie! Let me tell you, it is STILL a struggle. My mom loves giving trinkets, little things, and I have to let it go a lot of the time. I love her heart – gift-giving is her love language. We use the things until they aren’t being used anymore, then give them away. Sometimes, I still have my crazy “We are throwing everything away!” kind of days, but they are fewer and farther between. I’m glad God used it to speak to you! I love it when that happens. It’s interesting that minimalism is synonymous with “decluttering” in this post. I think minimalism, at its essence is not about having fewer physical items or a “curated collection”, but having fewer distractions from your highest priorities in life. Perhaps this obsession with “decluttering” is distracting so-called minimalists from giving energy to things that really nourish their soul? If you value feelings, relationships, loved ones, etc. then the true practice of minimalism would help you see that “decluttering” should take a back seat to those priorities. This is such a helpful contribution to this discussion, Polly! Thank you so much for commenting. Yes, I agree. I think many young moms get into minimalism because of decluttering, and it can lead to it becoming obsessive and about control. It also depends so heavily on who introduces you to minimalism in the first place. 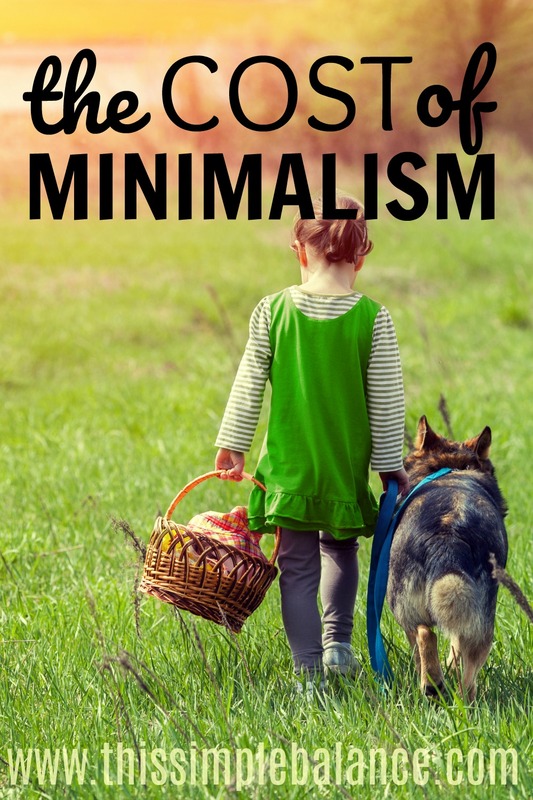 I’ve spent the past several months reading various books on minimalism, and every author approaches the subject from a completely different angle with a slightly different definition of and motivation for minimalism. So yes, I agree with you that decluttering can definitely be a distraction from the whole point, which is to free up time and energy to focus on things that add value to your life and to spend time with the people that matter. Thanks again Polly for sharing your thoughts! I love ongoing discussion about minimalism. Living simply, without embracing our sinfully materialistic culture, is wonderful. I wonder if some of the angst that comes with receiving gifts comes because we use simple living as a means to try to exert control over our circumstances, rather than trusting God to bring peace. We have turned living in God’s provision into a whole philosophy…minimalism…with self imposed rules. In a sense, that opens the door for things to still control us, and it is it’s own way of placing things over people. We become impatient with people who don’t fit neatly into our ideal. It’s an easy trap to fall into…Who doesn’t want to have a comfortable, smoothly running, decluttered home? I am working on this myself. But rigidity in this area can backfire on us, I think. Yours is not the first generation to struggle with too many toys from grandparents, and conversations may be needed…but with grace! I do agree that too much control is a pitfall of minimalists. It’s especially challenging to find that balance with kids. Thanks for sharing your wisdom, Elizabeth! It’s so hard in the beginning – asking our kids about getting rid of things. But even recently as I’ve started to adopt this practice, they have surprised me! They have approved throwing things away when I didn’t expect it. Other things, they asked to keep. I do continue to share with them the benefits of getting rid of things and try to apply some of the tips from this post. It’s a journey and a challenge – navigating minimalism with kids, but I think it will be so worth it as they grow! This was a really beautiful article, thank you for sharing it and for your honesty! I’ve just started along the path towards minimalism (although as a homeschooling mum of 5 I’m not sure how far I’ll get!). I really appreciate your reminder to put people first, even (or especially) if they come with clutter. You’re welcome Clare! The longer I walk the road of minimalism, the more questions I have. I think it’s a really personal journey, and I’m learning it doesn’t need to be prescriptive (I make a lot of things prescriptive and try to do them according to the book exactly – it’s just my nature). With this many kids, I’m realizing there is just going to be stuff. Big families can definitely benefit from decluttering – especially homeschooling families who are in the house so much more than other families with kids in school), but there is only so far you can go with this many people with different personalities and opinions and tendencies, unless you want to be a minimalist dictator, which you can clearly see from this post that I was headed in that direction. Personalize it and try not to get caught up in comparison. Good luck on your minimalism journey! I am glad that you owned up to the hurt you may have caused by your words to that child. I am a mother too and I understand the need for organization and minimalism for your own sanity. But I must say what you said to that child will be with him for life. Kids don’t forget things like that. I pray that you go out of your way to make it up to that child that made such a special gift for your family. God bless! Katya – thank you SO much for pointing this out to me! While I was repentant in my own heart, I have yet to actually apologize to him. The first chance I get, I will definitely apologize to him and let him know how much my kids have enjoyed that airplane since. He has such a generous spirit, and while he may not forget my unkind words, hopefully an apology and the encouragement will go a long way. Thanks again for commenting – it’s so helpful to see a situation with fresh eyes. Love this post. I too have such a despair of clutter and its so very difficult when you homeschool… And oh the grandparents gifts are the bardest. The baby boomer generation has such a love for gifts, especially toys. My girls have 3 amazing grandmas, and I would never want to break their hearts by rejecting a gift. Nowadays its hard because they always want a picture of the children wearing the outfit they bought or playing with the toy they gave. But ya… it stresses me out a bit as well…Its so different for us nowadays with so many mass produced and cheaply made toys and dollar stores on every corner. Its cheap, but at what price. I also cry at the environmental impact, or the impact our commercialism has on other countries where our toys are made. So hard to explain to baby boomers whose parents came out of the Great Depression and World Wars and all they wanted to do was dote on their kids. So… its always a complicated balance for sure… Writing this as my precious 5 year old is doing a stage show for me with a song she is making up on the spot…. gotta go enjoy the moment! Thanks Julie! I also find the generation gap hard to bridge, but I’m trying to ask more questions like “What was gift-giving like when you were a kid?” I find even in the current political climate, understanding is key. I’m right there with ya on fighting clutter, but the more kids I have, the more I wonder if some things are just part of this whole parenting deal (the cleaning and organizing and sorting through things that need get donated) that we are trying to circumvent with minimalism. As you said, balance is key. Enjoy that 5 year old! Thank you. Your words touched my heart. As I begin my journey into more intentional living, I am grateful to learn this lesson through your experience. I aporeciate your willingness to share it. You’re welcome Mary! Intentional living is life-changing, but as with anything else, you need balance. Best to you at the beginning of your journey! Oh this post helped in so many ways! I am a minimalist with a husband who tends to be a bit of a collector and have de-cluttered a number of times to stay on top of it. The hardest thing for me has always been my wardrobe. I never buy new clothes and am happy to wear one pair of jeans day in day out but my mother LOVES to give me her old clothes. Every single time I visit I leave with bags and bags of clothes and I get so frustrated with her because I feel like she just doesn’t understand how difficult it is to sort through the clothes and then make time to wear them just so she sees me in them and then sneaky get rid of them so I don’t hurt her feelings. She’s so insistant about how great they are and how expensive they are and I know she spends a lot on her clothes, but we have always had such different approaches to fashion and style. I’ve always felt a bit like she’s judging me and trying to say something about my lack of attention to my appearance. Reading your post has helped me see it in a new light. One persons trash is another persons well meaning thoughtful loving gift. I’ll keep accepting her bulging bags of second hand clothing but with a much more genuine smile in the future. Thank you! Your words told such a clear and powerful story. I was moved and will definitely look at minimalism differently. I love sentimental collections, my daughter who has been traveling the world for a year as a missionary? She definitely is coming home with a passion for “less”. I will look forward to sharing this post with her and others. Well said! Thanks for your encouragement Christa! More and more, I believe finding balance is key. Minimalism makes that difficult as most of the louder voices in minimalism generally take it to an extreme. Thanks for sharing – I hope it is thought-provoking for many and a reminder to find balance. Kelsey – I love your wording “social media minimalism”! That is exactly what I think I’m starting to question. But I do agree that when you homeschool, and are home all day, less stuff helps a whole lot. As I write this, LEGOs and Duplo blocks are underneath my feet. 🙂 Thanks for sharing your thoughts! Your blog is spot on. Anything we do at the cost of others feelings–especially a child’s is just plain selfish. As a child of a clean and neat freak I’m still wounded over things that were discarded or magically disappeared. It’s not fair. Children are helpless and defenseless and are not allowed to speak for themselves or make decisions. One of the greatest love languages is gift giving. The receiver however has to do just that. Receive it with the same love and gratitude it was given. I applaud your efforts to streamline your living and to admit your mistake. I see way too many homes filled with useless stuff that add no value to our life. And the lack of graciousness towards others.That said, might I suggest that that an even more important life lesson may have gotten missed. While being a Mom on a mission, we still need to take into account the occupants of our homes. As they live there too. First, as I understand it, the airplane was not your gift, so therefore it should not have been your choice as to keep it or toss it. But even more importantly you missed a very important teaching moment for your children. How will they learn to make the decisions of what is important to them and what can they part with. I see many adults unable to do this! And what might be unimportant to us , sometimes has great meaning to our children, Here is a suggestion that might work for you. When our children were growing up, I wanted to give them the respect of having choices over their things but at the same time with limits that We all could live with. I did not want to be one of those Moms that just threw things out when the children weren’t looking and ultimately make our children and spouse not trust us. So each child was given a bed box. A large box that could fit under their bed. This was where they could store their treasures, toys,and things that did not have a specific place. Plus they were allow one large item that would not fit in it. They had to make the decisions as to what was most important to them. And what they were willing to part with. There was no arguing as the amount of room was limited to that bed box. Every few weeks they would go through it spending time deciding and neatly repacking their things. This was an extremely important life lesson that taught them about choices, respect, and setting limits. And they were very proud of those hard decisions that they made. When they cleaned their rooms, they sometimes asked for suggestions to decide between 2 things. I tried to let them decide only giving suggestions about an item that they might want for future needs. As a home school Mom, I know you take their education seriously. And I’m sure you already realize that education is much more than just book knowledge. That being said, I too appreciated a clean home, but remember, you will have many years when they are grown to keep a perfect house. You only have now to show them that they are more important to you than your house or your image! Always keep learning! That’s good wisdom Peggy! Thanks so much for sharing. It is definitely a struggle, especially with a family this big and a small house. 🙂 I am coming to the same conclusions you stated (as hard as it is) – that I need to figure out how to help them learn themselves what to keep and what to part with so they are able to do it when they are older, along with the idea that this is their home, too and I need to give them more control as they get older over their space and their things. It’s tough when I’ve been making all the decisions for such a long time when they were small. I love the bed box idea! We have done something similar with our daughter, but haven’t implemented it with our younger boys yet. Its probably time. Thanks for the reminder and the advice. I love hearing from moms with more experience. I love minimalism too! What we do regarding gifts is we say no gifts needed for birthdays. When toys are given, they can play with them for a week as I suss out what goes and what stays (and maybe taking a photo to give to the gifter). If something stays it has to replace a toy, so if they are bored with it by the end of the week, no one wants to keep it anyway. That’s a great idea for birthdays. I love the one toy in one toy out rule, too. Thanks for sharing, Nikki! You’re welcome, Missy! I’m glad you enjoyed it. While I wouldn’t call myself minimalist, I get the declutter thing. I am guilty of hating gifts because they make my life harder. You bring a very good point. It’s important that we teach our kids to be thankful. How can we do that if we aren’t thankful? Thank you for this! Hi, I enjoyed your stories very much and I agree that we need to learn to be grateful for the people in our lives. As regards to gift giving, I ended up sharing and giving mostly food to my friends and relatives. I bake my own breads, cookies and make my own kimchi, tofu and tempeh. Sometimes when I post my latest ventures, I’d get requests from nieces and nephews or cousins. It pleases me to be able to share things that will be enjoyed and help my relatives save money and eat better. You’re welcome Ima! Thanks for sharing your ideas for gift-giving. I do agree that I’ve found consumable gifts to be the best kind, especially for people I don’t know well. I will give chalk and bubbles for kid’s birthday presents, for example. Thanks again for stopping by. I found your blog through MoneySavingMom. You are a gifted writer, and you’ve shared lots of great ideas in your posts. I know your blog will be a blessing to many moms out there!